Number bonds. We all use them in our adult life without even realising it. When adding up items in our basket at the supermarket, we know that 3p and 7p is 10p, and that 2x 50p is £1. When we buy something for £5.60 at the market and hand over a £10 note, we know that £5.60 + 40p is £6 and another £4 makes £10, so we know to expect £4.40 change. Knowing our number bonds is extremely useful, but a lot of children struggle to learn them. Over the years I have successfully taught many children how to remember their number bonds. As with times tables, the key is to find multi-sensory ways to teach, and to make practising fun. Some children respond very well to visual clues, and to help these I use colour strips. These are strips marked out in 10 sections and coloured in contrasting colours, so that children can see clearly that 2 red squares plus 8 green squares equals 10 squares altogether, and that 8 green squares plus 2 red squares also equals 10 squares altogether. They are small enough to hold in the hand, and I tend to use them in conjunction with other methods. The children I tutor find them really useful to refer to during games. Snap and pelmanism are always popular games, and I have made two sets of cards for this. The first set is colour-coded, so when the children turn the cards over there is a visual clue as to whether the two cards add up to 10. When they turn over the first card, I encourage them to work out what number they need to find to make 10. When the children are a little more confident I switch to the black and white ones to remove the visual clue, but we still play the same games to keep some familiarity. Another card game I play is Imprison the Villain, which is played in the same way as Old Maid/Donkey/Chase the Ace. I use these lovely monster cards, which I downloaded from Primary Resources. I coloured mine in for added attraction and laminated them for durability. I have one last set of number bonds cards which I made especially for one boy. He was struggling with number bonds, and as his home language was Bengali not English, as an experiment I found the numbers in Bengali on the internet and made him a set of dual language numbers cards. They have the numbers in words and figures in Bengali and English. They worked! When he saw them his eyes lit up and he pointed excitedly saying “I know these numbers!” The cards really increased his motivation and it didn’t take him long to learn them. There are also a couple of fun number bonds games on Sue Kerrigan’s Let Me Learn website. I have Number Bombs and the similar but seasonal Elf Splat. There are two game boards for each of these games, one for addition and one for subtraction, which are both versatile enough to use for number bonds to 10 and 20. I haven’t tried this game with any girls yet, but the boys love it, and now I get greeted with “Are we going to play Number Bombs today?” My answer is always “We don’t need to now – you already know your number bonds to ten!” However because it is so popular we do sometimes play it at the end of a session as a reward for good work! Another game that children seem to love is ping pong. I can’t remember where I first heard about this game, but it’s played like a game of table tennis except that you bounce numbers backwards and forwards instead of a ball. I begin by establishing a rhythm – I say ‘ping’ and the child replies ‘pong’. Then I start calling numbers from 1-10 and the child gives me the corresponding number that adds to 10. As we speak we swing an imaginary table tennis paddle to hit the numbers. For extra fun and an exercise involving whole body movement, stand opposite sides of the table with real paddles. For progression to 20, I have found a dominoes game which you will find if you follow the link to Primary Resources and type dominoes in the search box. It takes a little practise because many children don’t know how to play dominoes, but once they get the hang of it, it proves quite a popular game. For moving children on and helping them to see that when they know their number bonds to ten, and understand the pattern for making twenty, it’s quite easy to use this knowledge to find bonds for any multiples of ten, Sue is developing some resources based around football which highlight the patterns for making 30. I have been lucky enough to trial these resources. There is a write-on wipe-off card which explains how to use your knowledge of number bonds to make 30, and then a booklet to practise in. There is also a game to play – similar to Number Bombs, but with the added excitement that if you land on certain squares you can get ‘sent off’ and you have to remove one of your counters. I have only recently starting trialing this game, but it is proving popular so far. Finally, the set includes a match report card, where you can tick off each goal as you achieve them: working out number bonds to 10 on fingers, knowing number bonds to 10 from memory etc. Games are fun, but sometimes children need other ways to make those numbers stick, and word association is often helpful. I have found a few number bonds rhymes on the internet, but I find it works better when the children write their own. I have helped children to write their own rhymes, such as “5 plus 5 like to go for a drive” or “7 plus 3 go to Devon for their tea”. They then illustrate each of the rhymes with pictures such as two number 5s in an open top car, or the numbers 7 and 3 having a picnic under a sign saying Devon. One Year 6 girl I worked with found it really hard to remember which numbers added to ten, and she was really down-hearted at being so far behind her classmates. We used this word association method and she found that she could remember her own poem and the pictures really easily. To begin with she said her rhyme every time before deciding which numbers went together. Eventually the numbers became so well embedded that she was able to dispense with the rhyme. By the time she moved on to secondary school, she was still behind her classmates, but she now knew that she could achieve in maths which really increased her confidence. And that’s why I really love my job. A is for… Adjectives. 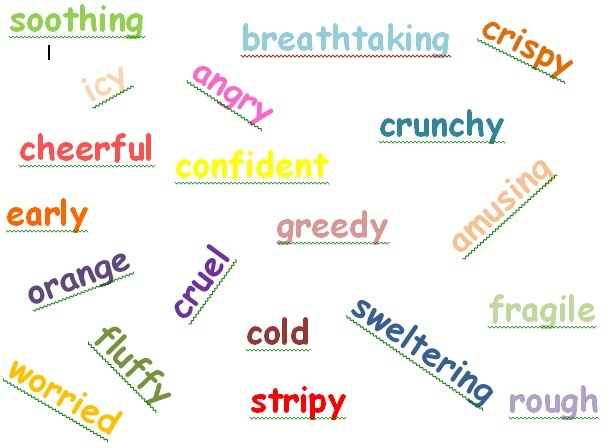 These are words used to describe things, and using them is an easy way to make your writ ing more interesting. For extra effect, try using two or three adjectives in a row with commas between them, so ‘a cat’ becomes ‘a fat, black, fluffy cat. To make your writing extra special, think about what things sound like and feel like, as well as what they look like: The cold, whistling wind blew the orange, crispy leaves from the thick, creaking branches. 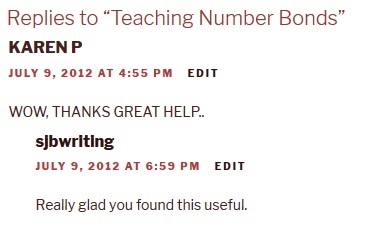 I’ve been tutoring maths for a number of years now. I’ve tutored boys and girls. I’ve tutored individuals and small groups. I’ve tutored children of all ages from very different social backgrounds. But they have all had one thing in common: none of them knew their times tables, and this was really hindering their progress in maths. Of course I told them that they needed to know their tables off by heart, but their parents and teachers had already told them this. If it was that easy they would have learnt them already. So this year I have made it my mission to get all the children I tutor to learn all of their times tables. To start with I created a desire to learn them. I made a colourful chart to show progress, and offered rewards of stickers for each of the tables that they learnt. But not just any old stickers – exciting, shiny ones that made their eyes light up when they saw them. The boys especially liked these football ones from Superstickers. Now I had children who were desperate to learn their times tables. What next? We took the tables one at a time and started by chanting them. When we had chanted them forwards a few times, we did them backwards, then odd numbers only and even numbers only to get used to the idea of knowing them out of order. After that it was a case of practise, practise, practise. The trick was finding enough different ways to practise the same thing so that the children didn’t get bored with it. I made some sets of cards with the questions and answers so that we could play pelmanism, and these proved very popular. I encouraged the children to read aloud the question as they turned each card over, and to work out what answer they needed to match before turning over the next card. We also used the same cards to play snap, and a race against the clock game to match all up all of the question cards with their answers – trying to be faster each time. Although the children loved all of these games, I was very aware that I couldn’t rely on the same sets of cards forever without the children thinking “Oh no – not those again!” and losing motivation. I looked around for some new ideas and found some lovely products on Sue Kerrigan’s let me learn website. The turn table cards were recommended to me by the trainer on a dyslexia course I attended. They are designed for multi-sensory learning and are really good fun to play with. 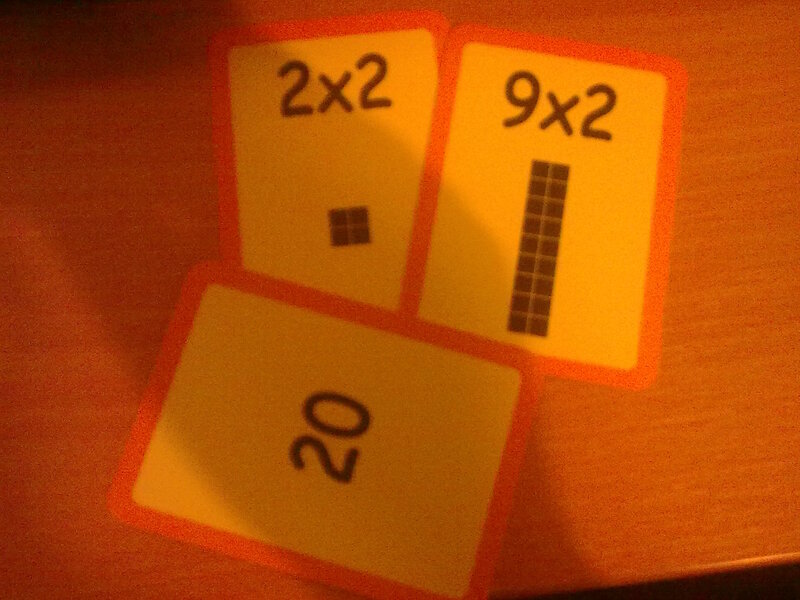 On one side of the card they have a question eg 2×3 and a picture of an array to show children what 2×3 looks like and to give them a visual clue. On the other side is the answer. The children say the question and answer aloud (hearing their own voice) and then turn over the card to see if they are correct. There is a video of how to use them here . I usually use them with one child at a time, focusing on one set of tables at a time, using them as shown in the video, and then doing races against the clock to beat their own personal time. However I have also used them with a group of children each working on a different set of tables. One group of girls I worked with recently, who were all working on the same set of tables, made up another game to play with these cards which they found great fun: all of the cards were put answer-side-up in the middle of the table. I called out a question and they had to grab the card they thought showed the correct answer. They turned the card over to see if they were right, and if they were, they repeated the question and answer and kept the card. If they were wrong they replaced the card. The winner was the girl with the most cards when they had all been grabbed. All of the children I have used these cards with have really enjoyed it, and I’m sure there are many more games that can be invented using them. 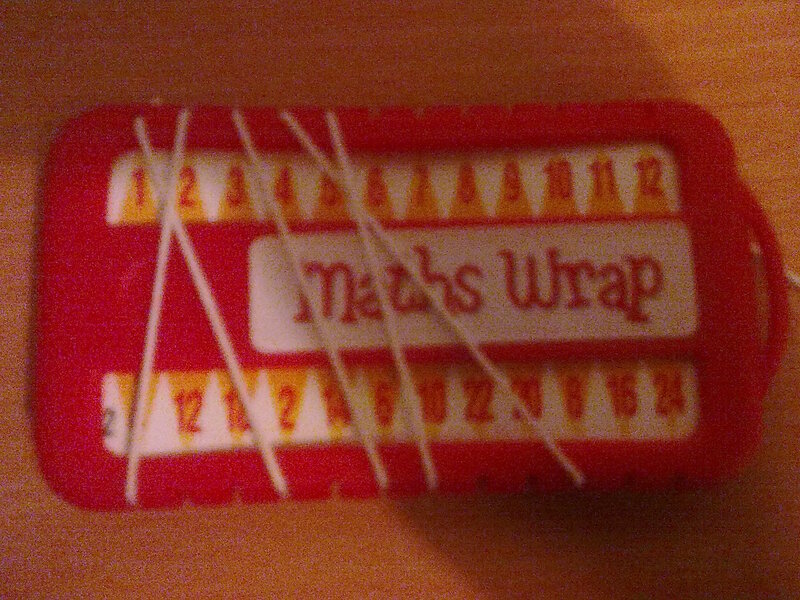 I found the maths wrap while I was browsing the site, and just thought I would give it a go. It’s used for learning tables “in order”, but is great for kinaesthetic learners. 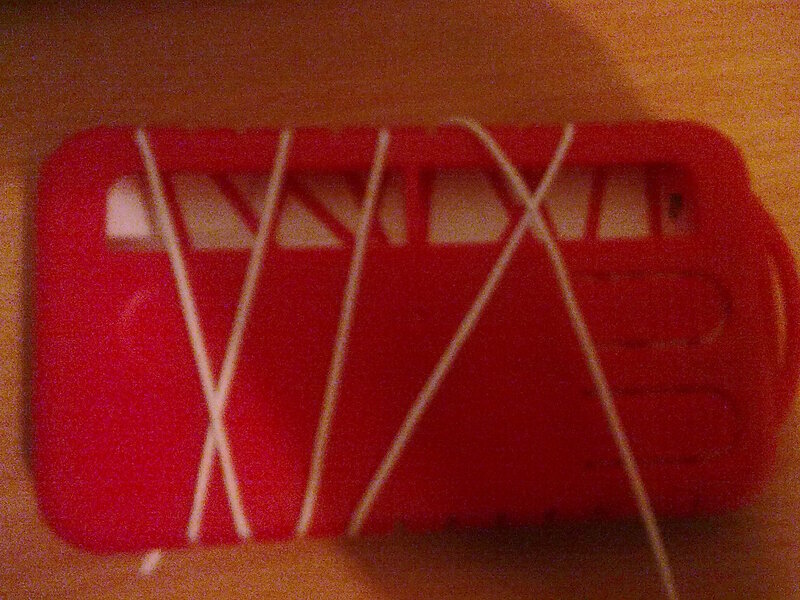 Across the top is a strip with numbers 1 to 12. At the bottom is space to put a strip of one of the tables, each of which contains all the answers but jumbled. You have to chant the tables aloud, hunting for the correct answer along the bottom strip and then wrapping the string around the correct number each time. When you have finished you can turn it over to look at the pattern marked on the back. If the children have got all the answers correct, the pattern made by the string will match the pattern printed on the back of the card. When I bought it, I thought it might be one just for the girls, but actually the boys have enjoyed using it just as much. One of my Year 5 boys said “Every child should have one of these. They’re really cool!” I even had texts from two mums, because their sons had been talking so much about how much fun it was that they wanted to know where I got them from so that they could get them as stocking fillers. As we progressed through the tables we looked at how few they had left. By using counters to demonstrate that for example 2×3 was the same as 3×2, we were able to colour code each new set of tables to show which ones they already knew and which ones were still to be learnt. They learned the easy ones (2x, 5x and 10x) first, which made the chart look less bare, and earned them some shiny stickers pretty quickly. Then they did 4x (easy because it was double 2s). 3x came next (tricky but the colour coding showed that they already knew 2, 4, 5 and 10 x3, so there where only half of them still to learn). Then 6x was easy because it was double 3s. By the time we came to the tricky ones like 7x, the progress chart was looking quite full, and the colour coding showed that they already knew 2, 3, 4, 5, 6 and 10x 7, so all that was left was 7×7, 8×7 and 9×7. Suddenly the sevens didn’t seem so scary and the motivation continued. Of course it took a long time, although considering the fact that I only see these children once a week it took less time than I expected. In September two of my boys didn’t know any of their times tables, not even 2x or 10x. They now know all of them. Not only do they know them off by heart, but they are able to apply them in all areas of maths, for example working with equivalent fractions. They immediately recognise numbers that are in their times tables which means their skills in division have improved. Their mental arithmetic skills have improved because they can multiply 6 by 7 straight away, instead of having to count up 7 lots of 6 on their fingers, so they have more time to think about what the questions are asking them to do with the information. They have both moved up a maths group at school and their confidence is higher. One of them said to me recently that he used to hate maths, but that he really loves it now. And that’s why I really love my job! For maths and English tutoring in the north Birmingham, Sandwell and Walsall areas, visit www.sjbteaching.com. For links to other interesting education related articles, come and Like my Facebook page. Languages at 5 – what’s all the fuss about? The government suggest that children should start learning languages at the age of five, and suddenly in true British fashion we are throwing up our hands in horror. We are criticising the government for suggesting such a ridiculous idea. We are throwing up every obstacle we can think of, dismissing as irrelevant the fact that other countries teach their children English from a young age, and focusing firmly on the negative. One of the poorest excuses for not learning a language I have heard in the last 24 hours is: “It’s different for us. We’re an island so we are more cut off from the rest of Europe.” Maybe you forgot, but we are connected to mainland Europe by train lines now. It’s quicker for someone in London to get to a non-English speaking city, than for someone in Frankfurt to get to a non-German speaking city. “What’s the point in teaching our children a foreign language when they haven’t got a wide English vocabulary yet, and they are still struggling with the complexities of our own grammar?” The point is that at this age language skills come more easily to them. When they are still mispronouncing some words in their own language they are not afraid to have a go at pronouncing foreign words. In the last couple of years I have taught a variety of languages to Foundation Stage and Key Stage 1 children. They have sung French songs in a presentation for new parents, German ones in school assemblies, and Latin carols in Christmas plays. In fact last Christmas one 5 year old girl I had been teaching was so confident that she sang a solo in Latin! I’ve told them stories in a number of different languages, and they have taken great delight in joining in with repeated phrases. They have learnt not to get hung up about understanding every single word as long as they understand the important parts. These children have been praised for their abilities and they now see having knowledge of a foreign language as something to be proud of, not something to be scared of. Nobody is suggesting that we suddenly expose a five year old to the difficulties of German cases, so let’s do something really radical. Let’s put all our language prejudices aside and examine the positive side of teaching languages to children at a younger age. One of the main frustrations in learning a new language is not being able to express yourself in that language as easily as you can in your own, and this is what causes a lot of learners to lose heart and give up. The older you are when you begin to learn a second language, the greater the chasm between your ability in your own language and in the one you are learning. By beginning to give children the tools they need to learn a second language, we are closing that gap. At this young age children are happy to be learning just words and short phrases, so there is no need for teachers to worry that they don’t have enough knowledge. Starting teaching languages at 5 lays foundations for more in-depth language learning in KS2. The children already have 2 years of vocabulary behind them so by the time they start to learn some grammar they have enough words at their disposal to build useful sentences with. Why then stop at reinforcing English? I have taught children to tell the time in French the week after they did it in their maths lesson, thus consolidating what they have learnt. The children were happy to do it again because it was in a different language, and those children who had struggled to tell the time when it was taught in English had a second chance to pick it up. We already have several generations who are terrified by the thought of speaking another language. Don’t we owe it to our children to let them be the ones to whom it is second nature? It’s a question I’ve often asked myself when I’ve read children’s work and seen capital letters in the middle of sentences; lines and lines of writing without a full stop, and then a random one placed for no apparent reason; and exclamation marks in the middle of instructions. So why do they do that? For the last two years I have been lucky enough to be contracted for 1-2-1 tuition with a number of children. By working so closely with them I have gained an insight into how their minds work when they are writing, and some of life’s great mysteries have been revealed. Let’s start with capitalisation in the middle of sentences. What’s that all about then? “Miss told us that names have to start with capital letters,” they told me when I asked. And “apple” is the name of a fruit, and “oak” is the name of a tree. Unfortunately, somewhere down the school they were also told that nouns are naming words (yes, I know, I think I’ve been guilty of that one as well), so now every noun has a capital letter. How about full stops? I’ve been that teacher that nags the class “Don’t forget to put full stops at the end of every sentence!” and I know I’m not the only one. When I’ve asked the children I’ve been tutoring what they know about full stops, they happily parrot, “You have to put one at the end of every sentence.” They know. So why don’t they do it? Because it seems, a lot of children have no idea what a sentence is. So they just keep on writing till they have no more ideas, and then put a full stop. Then when they think of a new idea, they start a new sentence. What about those exclamation marks that appear at the end of sentences such as, “First, take the bread out of the packet! Next, get the butter out of the fridge!”? I was baffled when I first asked a child, whose writing target was to use exclamation marks correctly, when he thought he should use them and he told me that you had to use them every time you were telling somebody how to do something. It seems he thought it was called an explanation mark! And he’s not alone. I’ve tutored 3 children of different ages from different schools who all thought the same things, so it’s obviously a fairly common misconception. All these things are really easy to correct when you have time to work one-to-one with the children – but not so easy when you have 29 other children needing your attention, because no matter how much you want to you just don’t have time to spend half an hour with one child. That’s why I really love my job.